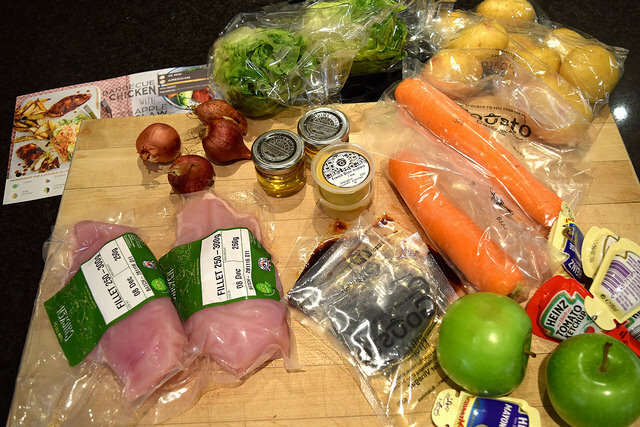 Most of you went back to work yesterday, so I thought now would be the perfect time to share the next in my series of recipe box reviews (I’ve got a couple more lined up so you can really choose the best box for you), Gousto‘s Four Person Family Recipe Box. When I needed to feed anyone and I’m coming home from a day at the office, I find it so much easier to have all of the ingredients and what I’m going to be cooking ready for me. As with all of the other recipe boxes I’ve reviewed so far, my Gousto box was ready for me when I got home, and everything was wonderfully packaged up and kept chilled when need be. 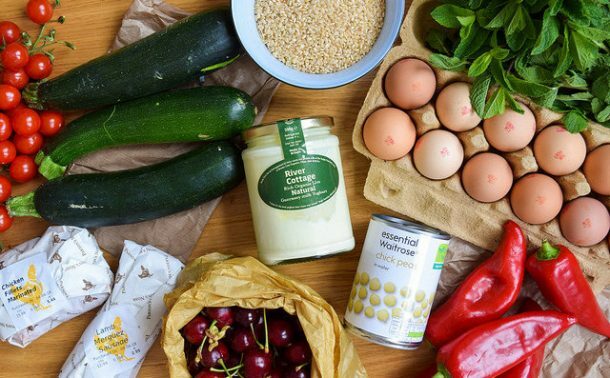 Something that is different from any other other services I’ve tried so far is that Gousto have the option of add-ons, to make your life a little easier. I had some popcorn in my order for afters, but you can also order pantry items you may have run out of like salt and pepper, or a bottle of wine or a (high quality) pre-made dessert to go with the meal. For busy people who sometimes don’t have the chance to pick up essentials they’ve run out of, I think this is fantastic. 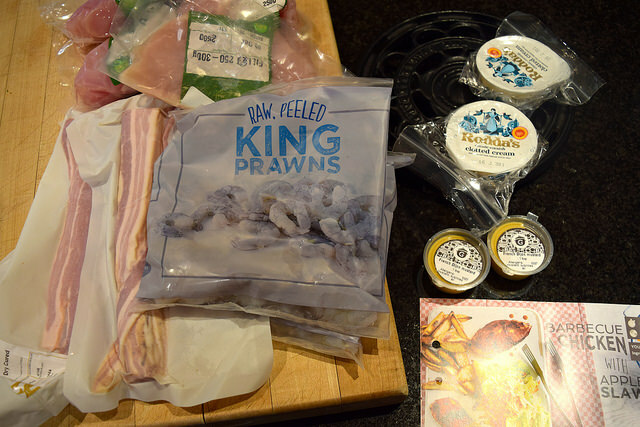 All of the ingredients were of great quality also (only beaten by Riverford, but there you are paying for a little extra in that category), but I did have some qualms about how much packaging there was. For example, who in their right mid individually wrap carrots in plastic? Also, I could see that everything was doubled to save on creating the two person and the four person boxes, but that also meant I used four little individual squeezy mayo packets to make slaw, and had to deal with two mini glass honey jars to make barbecue sauce. I think this could have been done in a less package intensive way, such as just using the plain sachets that came with most of the measured liquids, sauces and spices in my (sadly now discontinued) Marley Spoon box. Now onto the meals themselves. On weeknights, I made Barbecue Chicken with Apple Slaw, and the Bacon and Sage Wrapped Chicken. Both meals were absolutely delicious, and enjoyed by all. The portions were generous so there was certainly enough food. The only downside to this is that we’re a family of three, not four, so while I adapted the Bacon and Sage Wrapped Chicken to serve three as the leftover ingredients were mostly things we had in our fridge anyway (though some clotted cream got wasted), the Barbecue Chicken with Apple Slaw really did not keep very well as leftovers for my lunch the next day. Some boxes I have coming up in reviews do have the option to feed groups of people that are not two or four, so that is something to keep in mind. 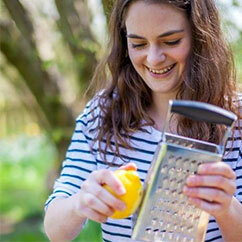 We loved the box, but it is perhaps only right for you with those sized households. 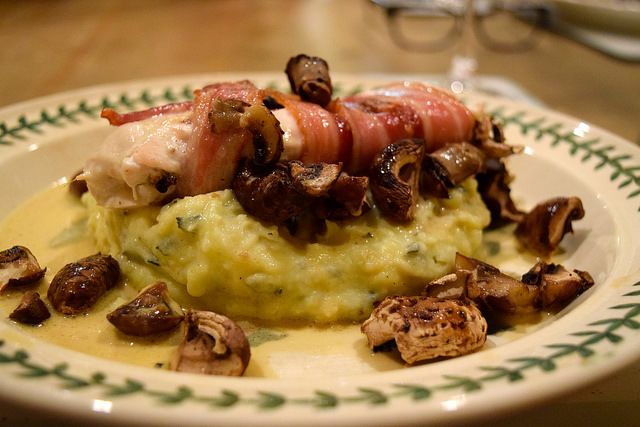 Finally on these two recipes, I was so impressed with the Bacon and Sage Wrapped Chicken. I’d never actually roasted mushrooms before and that was quick and easy, and it was such an impressive, indulgent dish that was really quick and easy to throw together. 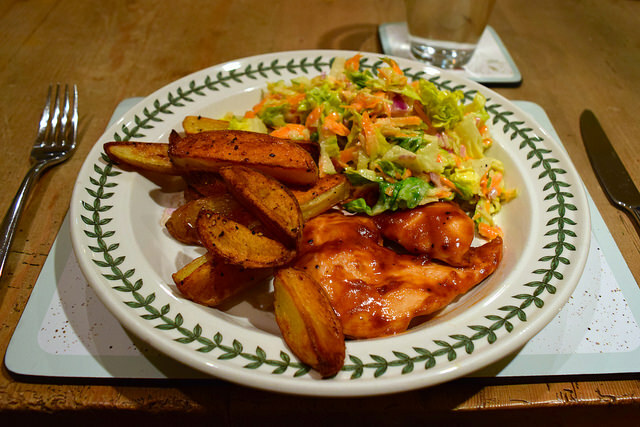 However, with all of the grating involved, the Barbecue Chicken with Apple Slaw I think was a bit too involved for after a long (and on that day particularly hard) day at the office. 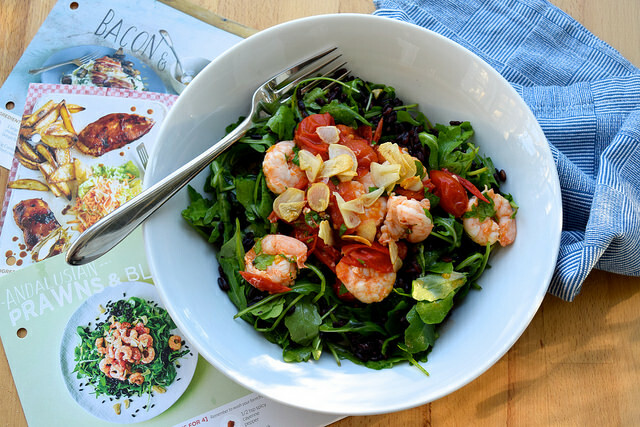 I kept back the Andalusian Prawns & Black Rice Salad for the weekend and made it at lunchtime to serve with a nice cold bottle of wine (it was during one of those lovely warm days we had mid-December!) and it was absolutely perfect. 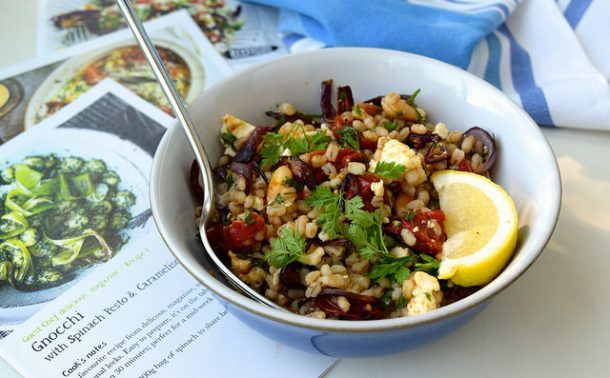 Really easy to make, and full of punchy flavours. And it did also keep very well for my lunch the next day, proving that perhaps if you do want to order and there are only three of you in the house, the leftover thing is totally do-able if you choose your recipes (from their very balanced selection with something for everyone) carefully. My only qualm was that I only needed one of the two lemons they gave me (the recipe called for around half, and they of course send a whole lemon in the two person box, so doubled everything and sent two!) However, half a lemon to squeeze over my morning avocado in the fridge is not the end of the world! 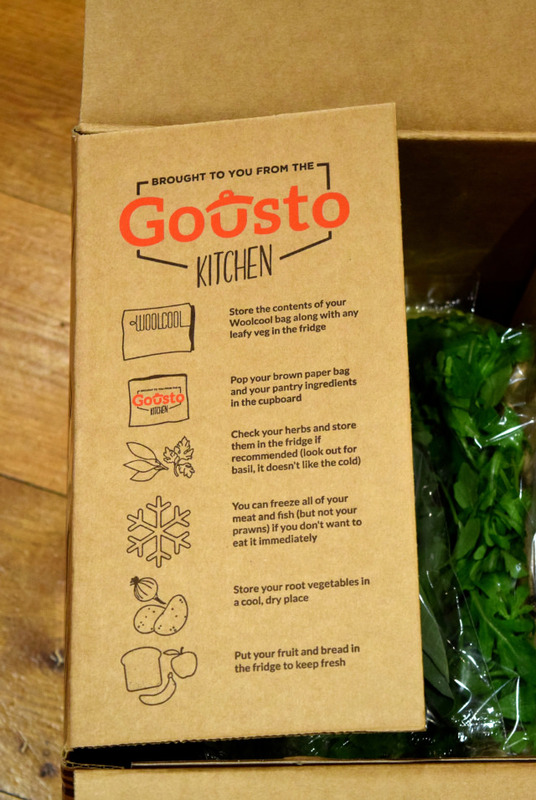 So, what was my final verdict on the Gousto box so far? While you can go totally veggie, I don’t think the veggie recipes they had on offer at the time I made my recipe selection held up to Riverford based on the quality of the ingredients, but I thought this was the best meat/ fish eater friendly box I’ve tried so far. Price-wise, this Gousto three recipe, four person meal box cost £51.99, which works out at £4.33 per serving. 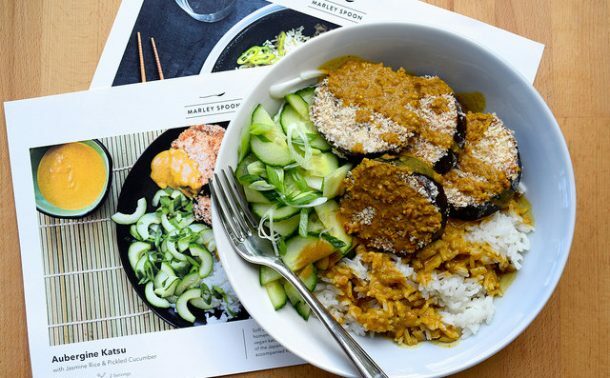 To be able to compare it to Riverford, Gousto’s three recipe, two person box costs £34.99, which comes in at £5.83 per serving. My (veggie) Riverford box with the same number of meals was £33.95 for the box, which came in at £5.65 per portion. When you think that Gousto contains meat, it is the much better deal as the ingredients are all of a very good quality, unless everything being organic is really important to you. 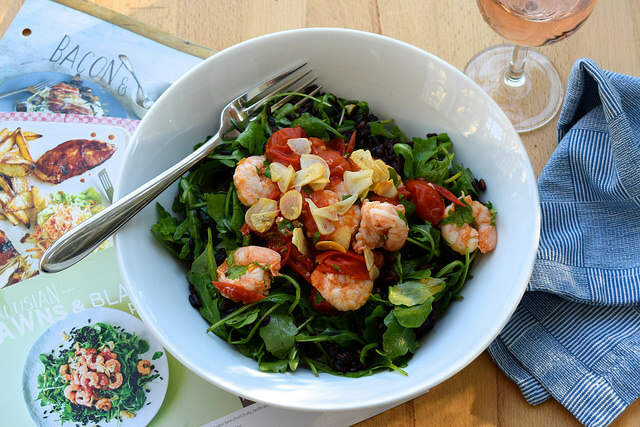 You can look at all the box options (you can choose between 2-4 recipes per box for 2 or 4 people) on the Gousto website, and you can get a taste of some of their up and coming recipes here. 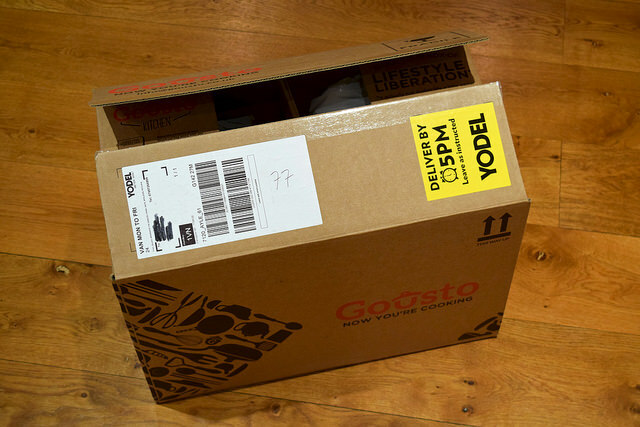 Oh, and a big thank you to Gousto for arranging this box for me to review, and you can read all of my recipe box reviews here.